NOOOOO!!! AAAAAAGH!! Okay, sorry. I’m just really sad because, guess what?! Are you ready to hear this? Okay, here we go……. I don’t know why, but this picture saved really blurry…..
Then we have her!!! AAAAGH!! So I had heard a rumor, that there are supposed to be 2 new MAG dolls released when the line gets revamped to TrulyMe next month…. But since there’s three dolls that are no longer available, I wonder if there will actually be three new dolls? 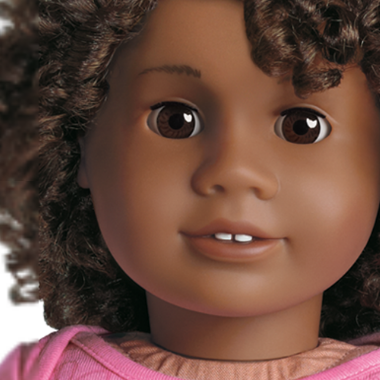 Hmmm…..
Are you sad about these dolls retiring? What are your thoughts on TrulyMe? Aww that’s so sad… I actually loved the last doll as well. How and when did you finds out Jaclynn? Noo!!! Oh well! I heard one will be a African American and one will be a 50s girl named Mary-Ellen! They are also retiring Caroline. P.S. Is it definite that Caroline is retiring? Oh my gosh, they did??? I had no idea! That’s really upsetting and I’m feel so bad for you. I’m excited for Truly Me, because that probably means the MAGs will get new meet outfits, but it still stinks that they had to retire these dolls. I hope that when Truly Me comes out, they release dolls similar to these ones. Yeah! But it’s weird – When I posted this, it said “no longer available” on those dolls and you couldn’t add them to your cart, but now they’re available again! Maybe AG was glitching and it’s something that will still happen in the future…. WHAT?!!!! They are renaming MAG TrulyMe? And they are retiring Caroline?!! NOOO! Wha-huh? What’s trulyme? I are they just moving from one name to the other? Weird! JLY, MAG, trulyme. 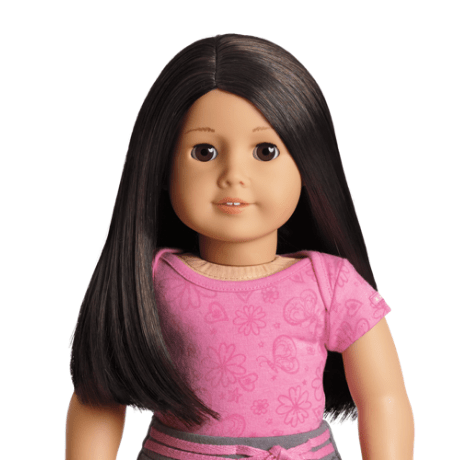 Oh, I just discovered a love for the black haired, blue eyed doll, too! Just yesterday, actually! LOL! Well, I am excited for new outfits. Yeah, I really liked her for a long time but then my friend got her, which made me love her more cuz I saw her up close, but now it’s weird for us to have the same doll. Especially because we live real far apart now, and I would old want to tell her, LOL!! Peace~I love the one with long blond curly hair and freckles!!! 😀 She’s my favorite MAG. Which two were the ones you wanted? She looked (on the e-bay page) to be in excellent condition, just a bit of gray on her fingers, that I should be able to clean with Magic Eraser. I will see when she arrives (should be here late this week, as far as the delivery id says). They are definitely back up on the website to buy though, so I guess it’s just coming. I have Julie, and I kinda want the blonde, but I’m just happy I got #25, since she had to be a part of my collection. Geez, I really need to start a website of my own… I have like 10 dolls now, and I have a list of about 6 more I want. What in the world??????? 🙁 🙁 🙁 I personally think they shouldn’t retire any dolls. This is horrible! the last doll is so pretty. And why are they retiring Caroline? She’s too pretty to be retired! I know! I really want that doll! We were planning on possibly getting #58 (the first one) later this year! And she sells (judging by doll bloggers) extremely well! And the Julie lookalike! We wanted her, too! (Actually I don’t really mind her as much because Claire wanted her more than me, but we already have 3 blond haired dolls, than we’ll get Kit and #56, who has curly blond hair, freckles, blue eyes) and that’s kind od enough blond dolls for me, because I really want a lot of diversity, so……. And 25 (also judging by doll bloggers) sells extremely well, too! What are they doing? Jaclynn, I bet that if you really wanted her, you could find one on Ebay pretty easily for the same price or cheaper as AG. I kinda wonder whether the first one is going to look really similar to the 60s or whatever time she is. In the 60s then a lot of popular music groups (the Supremes is one I know right of the top of my head) had these big, awesome hairdos, and aince she kind of has big hair, they didn’t want a historical to look like a MYAG. I would be surprised if that wasn’t partially why they retired the Julie look-a-like. Yeah, that’s the same with us. Also, I guess I didnt say Julie’s look alike number. It’s #53, in case you were wondering. AG announced that an African American doll will come out next year, and it’s rumored (from people who have been correct multiple times before, but I’m still skeptical) that it will bea 60s doll from Detroit who is into Motown. Hence, the 60s doll theory! Interesting. I hope maybe they will come out with some more unique combinations, no more original face mold dolls for a while! I’ve noticed other things disappearing one by one without any announcements too. I’m hoping that this next release and the one in the summer will have some exciting stuff in it, they have gotten rid of quite a few things over the past year. Yes! I’d love to see more face molds! Like Marie-Grace’s or even some new ones! I went on AG’s website and they are still there. Did you mean they are retiring?? 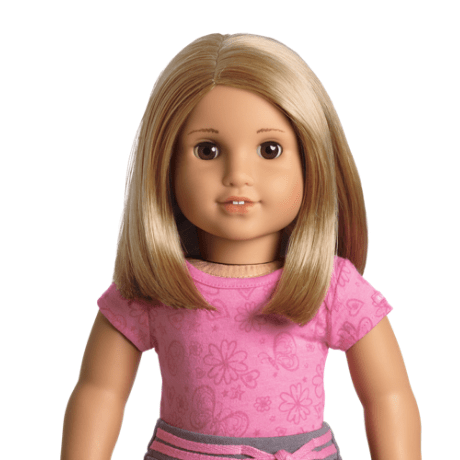 The last doll looked exactly like my bff and I was planning on getting the blonde one! I hope this isn’t true! Oh! It’s really a bummer when AG retires dolls. I have so many retired dolls now, and it’s kind of a nuisance I can’t get clothes for their time period/story from AG! However, new dolls and outfits are always exciting! I went to the website and I saw all 3 of them on there and they didn’t say ‘not available’. I am not sure if they are actually retiring them. They might be retiring maybe when Truly Me comes out. I’m working on saving up the money for Caroline. I almost have enough, but I don’t know if I’ll have enough for Mary Ellen too. But I need Caroline before she retires, she is first priority! P.S. This week I made my first doll dress! I’m going to practice and practice until it’s good enough to sell and be proud of…and hopefully on etsy. Then I might get enough for Mary Ellen! Another thing: So…my cousin has Felicity and Elizabeth. She never uses them and they aren’t in great condition. But…she’s going to send them to the doll hospital…AND SHE SAID THAT SHE MIGHT GIVE THEM TO ME!!!! Exciting or what, right?! I don’t know if it’s free or not, but it sounded like it would be free! TWO dolls for free! And if it costs money, then oh well. They are two retired dolls so it’s worth it and she’s one of my best friends, so I know how she is. She’d have a low price of like $30 or something, or give it to me for my birthday! Thanks!! 😀 I’m super happy right now! LOL, I thought I was the only person who said OMGOSH! 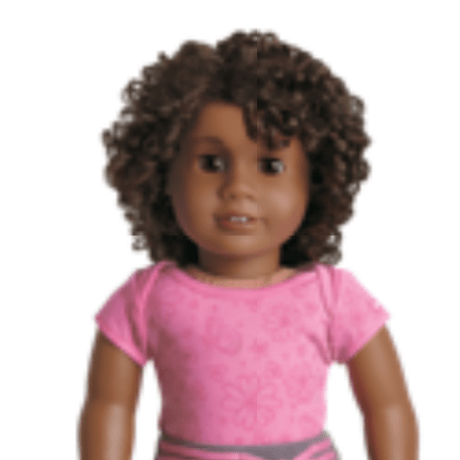 I really like afro girl and I was even thinking of a name for her, even though my parents said that I already have 5 dolls, so we’re not getting any more right now. The second is like a modern Julie! And the third is just really pretty! I am totally bummed out now, I really wanted the last two! I didn’t even know they retired them! I didn’t even know the are changing the name! I wonder if they are changing the outfits too, I don’t really like the outfits, they are kinda boring. LOLOL! That is so funny! XD I wish they wouldn’t change the names, though. Like seriously, what’s the point? LOL! Yeah, they change it every few years, and everyone just calls it Just Like You anyway. 😛 It’s super confusing. I could NOT get used to calling it My AG but Truly Me sounds like a collection not dolls! I don’t get why they change the name every few years-it makes no sense! Isn’t the point of naming a doll line to make it stick in everyone’s heads? So why would you change it?? I laughed and my bro and dad were like what daisy?! Wait a minute, I just check the website, and they are available and I also put them in my shopping bag and they went it! HOORAY!!!!! Just noticed that as well! I think AG will officially be retiring these dolls at the same time as they are releasing Truly Me. I betcha #33 is next! 33 is GORGEOUS! They CANNOT get rid of her!